The men and women who serve in the United States military, regardless of branch, deserve the honor, respect and thanks of a grateful nation. While no single act can truly thank the brave men and women who have served their country faithfully, we, as a nation, can at least provide them with greater opportunity here at home. Education grants and scholarships for military personnel, veterans, and their families is one way the United States thanks their servicemen and women. Scholarships and grants for veterans are supported by the Federal government, as well as by military associations, universities and private donors. After the sacrifices made by our military personnel and their families, it is only fitting they we help them to find new opportunities and greater successes here at home. Since the earliest days of the G.I Bill, the Federal government has been devoted to helping returning veterans find the funds they need to obtain a college education. As times have changed, so have the government’s financial aid programs for military veterans and their families. While programs continue to change with the times, the Federal resolve remains constant. These financial aid programs exist to help returning veterans define their own success at home by giving them much needed encouragement and support in their quest for a college education. The G.I. Bill is one of the most well known financial aid programs in the United States. It is no exaggeration to say that the introduction of the Montgomery G.I. Bill changed the face of the nation by giving returning veterans access to higher education. In many ways, the G.I. Bill built the new middle class that would become the backbone of the United States. The G.I. Bill has undergone many changes since its inception, but it continues to provide much needed financial assistance to veterans who wish to pursue a college education. Montgomery G.I. Bill benefits are available to military personnel who have agreed to have $100 withheld from their monthly pay allowance. Servicemen can also opt to have an addition $600 deducted from their monthly pay in order to receive greater benefits following their discharge from active service. The amount of financial aid available through the G.I. Bill will vary, and will depend on time served, and the contributions of the individual serviceman or woman. Typically, service-members who have received an honorable discharge are eligible for up to 36 months of education benefits, or roughly $37,000. The G.I. Bill is also available to reservists, and members of the National Guard, who have opted to pay into the program during their time of service. For these auxiliary members of the military, total education benefits will be approximately $11,000. G.I. Bill benefits can be used toward tuition costs at accredited colleges, universities and vocational schools across the country. Benefits include funding for tuition, housing, books and other ancillary college costs. All benefits are contingent upon the individuals term of military service, course of study and reserve status. Montgomery G.I. Bill benefits are payable up to ten years following the service-members release from active service. The Post 9/11 G. I. Bill was passed into law in 2009, and is an extension of the aforementioned Montgomery G. I. Bill. It was specifically designed to benefit servicemen and women who saw active duty immediately following the events of September 11, 2001. To be eligible, military personnel must have enlisted withing 90 days of September 10, 2001. Particular attention is given to those service-members who have been discharged due to a service related disability. The Post 9/11 Bill provides 36 months of financial assistance to eligible service-members who are pursuing a post-secondary education at an accredited college, university or technical school. Full tuition, including housing, books and attendant fees, will be paid for those servicemen and women who are enrolled in a public university or college. Veterans who choose to pursue their education at a private college or university, may apply for additional benefits through the Yellow Ribbon Project. Post 9/11 G.I. Bill benefits are available to veterans pursuing undergraduate and graduate level studies at an accredited college or university, as well as to veterans pursuing courses at an approved vocational or technical school. Benefits are awarded based on time served, manner of deployment and are contingent on veterans receiving an honorable discharge. In addition to the G.I..Bill, and the Post 9/11 G.I. Bill, there are a wide variety of available scholarships designed to encourage and support veterans in their quest for a college education. These scholarships are supported by both public and private funds, and are offered to eligible veterans who have been honorably discharged from military service. Requirements and award amounts will vary according to the program. The following examples are just a small sampling of scholarships designed to benefit veterans and their families. The AMVET National Scholarship Program is designed for those veterans who have exhausted the resources of the G.I. Bill. Applicants must have been honorably discharged, and must be attending an accredited college, university or technical school. The award is $1000 per academic year, renewable for up to three years. The Military Order of the Purple Heart Scholarship is available to all veterans who have been awarded the Purple Heart. The program is also open to widows and dependents of those service-members who have been awarded the Purple Heart posthumously. Award amounts vary, and are based on financial need. The American Legion Scholarship is available to all veteran members of the legion who are pursuing their undergraduate studies at an accredited college or university. Annual awards are $1000, and eligibility is determined by financial need. The Pat Tillman Foundation offers the Leadership Through Action – Tilman Military Scholars program which provides financial assistance to veterans and active-duty military who wish to start, continue, or finish their college education. Award amounts vary, and eligibility is determined by merit as well as financial need. Applicants are required to maintain a 3.0 GPA, and must submit two essays for consideration. The Troops to Teachers Program is administered by the U. S. Department of Defense, and provides financial support for veterans who choose to pursue a degree in teaching or education. Eligible applicants must agree to a term of service in a high need school or community in order to receive funding. Eligibility is determined by financial need, as well as academic merit. Many colleges and universities across the country have Divisions, or Offices, of Veteran’s Affairs on their campuses. Their purpose is to make transition to civilian life easier, while offering financial assistance for servicemen and women who wish to pursue a college education. Available programs will vary from college to college, and all veterans and active-duty military personnel are encouraged to check with their school to see what programs are in place to help them achieve their educational goals. The examples that follow will provide a glimpse of the types of programs being offered to both active and retired military personnel through the auspices of their own college or university. Michigan State University’s Office of Veterans Affairs supports a number of financial aid programs, including the MSU Disabled Veterans Assistance Program. The program offers new, and returning, undergraduate veterans with a military-related disability financial support to complete their college education. Expenses covered include full tuition, housing, books and related college costs. Grantham University offers a number of military-related scholarships, including the Military Service Members Scholarship, the Military Severely Injured Scholarship and the Military Veterans Scholarship. De Anza College offers scholarships for veterans who have been injured in the line of duty. Applicants must have a minimum 2.5 GPA, and must maintain an enrollment of at least 6 credit hours per quarter. All applicants must have sustained an injury in combat. Awards are $2,000, and are determined by financial need. Military service has long been a stepping stone to higher education. Those serving in all branches of the U.S. Military, as well as reservists,veterans and their families, have access to a wide range of valuable financial assistance programs designed to make higher education more accessible. Many branches of the military offer substantial grants and scholarships, as well as loan repayment programs, for active and retired service-members and their families. The Reserve Officers Training Corps, or ROTC is one of the most popular sources for military-related scholarships. Most high schools and colleges in the country have some level of ROTC presence on their campuses. The ROTC offers students the opportunity to receive financial assistance for college while training to take their place as officers in one of the many branches of the U.S. Military. ROTC programs are in place for each of the major military branches, including the Army, the Navy, the Air Force and the Marines. Students enlisting in an ROTC program must agree to take a series of military science courses, in preparation for an agreed upon term of service in the related branch of the armed forces. In exchange for this term of service, students receive financial aid to cover the costs of tuition, housing and books. The ROTC is the foundation of all military-related financial, and has provided many students with the necessary funds to obtain a college education. However, students considering the ROTC should understand that they are agreeing to a contract that requires military service. While the ROTC is a good source for college funding, it should not be entered into lightly. Financial aid for active-duty service-members is available from every branch of the U. S. Military. 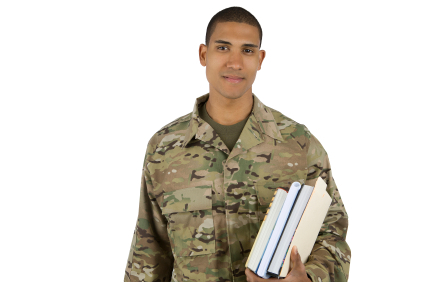 Scholarships, grants and tuition assistance programs are often used as recruiting incentives, and offer educational opportunities in exchange for military service. While this is a very viable, and rewarding, way to find funding for college, students should note that these programs require service commitments. Recipients must agree to a predetermined term of service in the military in order to receive awards. Enlisting in any brand of the military is an honorable decision, but it is not to be taken without due consideration. The following examples will show the breadth of financial aid programs available to enlisted servicemen and women, as well as to their spouses and dependents. The Air Force Tuition Assistance Program offers financial aid to active-duty personnel who wish to complete their college education while enlisted. Funds can be applied to either on-base, or off-base, schools. Award amounts are contingent upon time served, and range from partial to full tuition grants. The Navy College Fund offers funding for enlisted sailors over and above what they are eligible to receive from the G. I. Bill. The purpose of the fund is to assist both active-duty and retired Navy personnel in the completion of a college education. Applicants must have an honorable standing in the service, and must meet general service and performance requirements. The Navy-Marine Corps Relief Society administers a number of grants and low interest loan programs for service-members, their spouses and dependents, including the Gold Star Scholarship and the Admiral Mike Boorda Loan Program. Financial aid amounts vary, and are determined by time of service and financial need. The U.S. Army’s Survivors and Dependents Assistance Program provides financial aid to the widowed spouses and children of service-members who were killed, or disabled, in the line of duty. The program offers up to 45 months of education benefits to be used while pursuing either a degree or certification at an accredited college or technical school. Military service is a brave, and honorable, choice that offers more than just financial rewards. They who have given so much, deserve the educational support and encouragement of a grateful nation. Veterans, active-duty personnel, and their families rightfully have access to a wide range of scholarships and grants to enable them to pursue a college education, and to find lasting success on the home-front.